Truphone today launched Truphone 3.0, a major new upgrade to its mobile VoIP application for the Apple iPod touch. Truphone 3.0 was already available for the Apple iPhone, so this release just brings the latest features to the popular iPhone touch. IM services currently supported include Skype, MSN Messenger, AIM, Yahoo! Messenger and Google Talk. It also does free calls when in Wi-Fi to other Truphone users as well as free WiFi calls to Skype and Google Talk users. Though I would like to see 3G data support to enable VoIP over 3G. Yes I know Apple blocks VoIP over 3G apps, but if you jailbreak your iPhone, you should be able to make VoIP over 3G calls. (read my tutorial on how to do VoIP over 3G on jailbroken iPhones) Yet, there is no mention whether their truphone app will work over 3G on jailbroken iPhones. 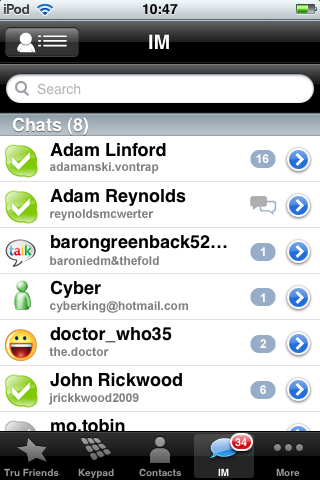 Ironic that in 2007 truphone was the first to demonstrate VoIP over WiFi on an Apple iPhone that they jailbreaked. Of course, you could use Truphone Anywhere for free calls, but that uses the 3G voice channel not 3G data. It leverages a callback system that uses your bucket of cell minutes for 'relatively' free calling. In any case, check out the news.